7.5"and 10" US-ION Skillets, 3mm USA wrought iron, made in Chicago in a patented single piece construction, per all the specifications in the campaign detail. Raw finish, wax coated, ready for seasoning. Introductory Early Bird offer, never to be repeated! Each pan is stamped 'First Edition', with month and year of manufacture, for heirloom collectibility. Limited stamped 'First Edition' only for Kickstarter backers in this campaign, never again! The Solidteknics iron pan is crafted with American iron, is impossible to break, and cooks and seasons like cast iron. Best of all, it is much lighter in weight and simply easier to use. Whether you’re chasing the perfect caramelized brussels sprouts or finding the just-right sear to your steak, our Solidteknics wrought iron pan is as versatile in the kitchen as you are. From coals, to cooktops, to the kitchen table, this pan was designed for the cook who wants to make memories just as much as recipes. We took inspiration from French carbon steel pans — for centuries a chef's favorite — and made ours even better. We have discovered an innovative way to form a pan body and handle as a single solid monobloc, removing all welds, screws, and the dreaded rivets (the bane of every chef's existence). This seamless wrought construction makes our pans easy to clean, and basically indestructible (you can say goodbye to loose jiggly handles). Old-timers, you thought American-made 'wrought iron' was extinct?! In the nostalgic old puddled and hand-wrought form it is. Good news: this is real iron, and it's machine wrought (worked into final seamless pan shape from flat), so it is indeed 'wrought iron'. Just modernized, optimized, revolutionized for a new era in cookware. Time for a new definition! 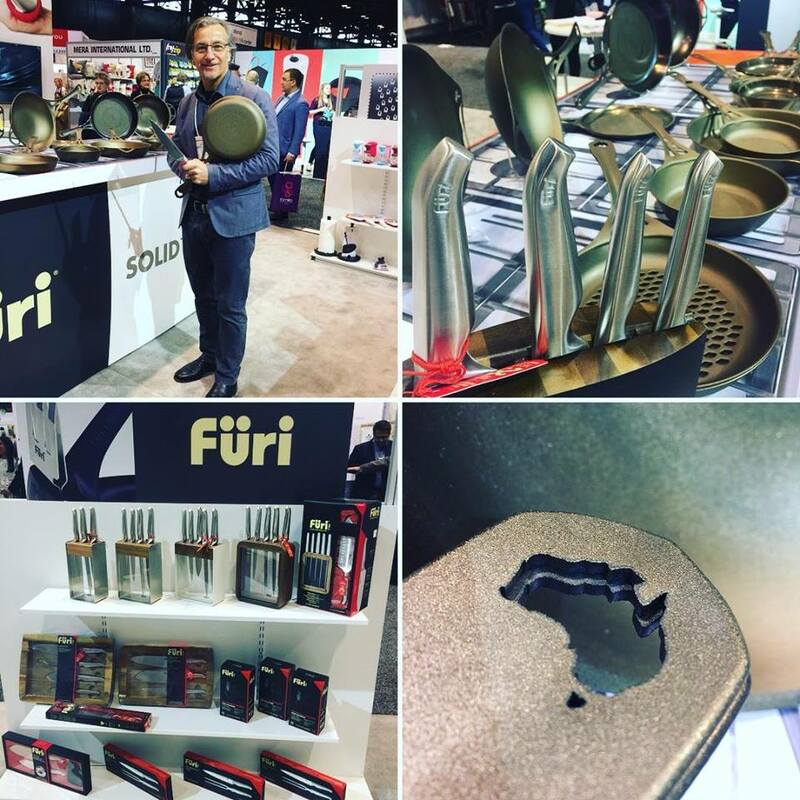 At solid 3mm, our thicker pans won't warp under high heat like thin carbon steel pans, which means you can safely cook with any heat source, from induction to roaring campfire. 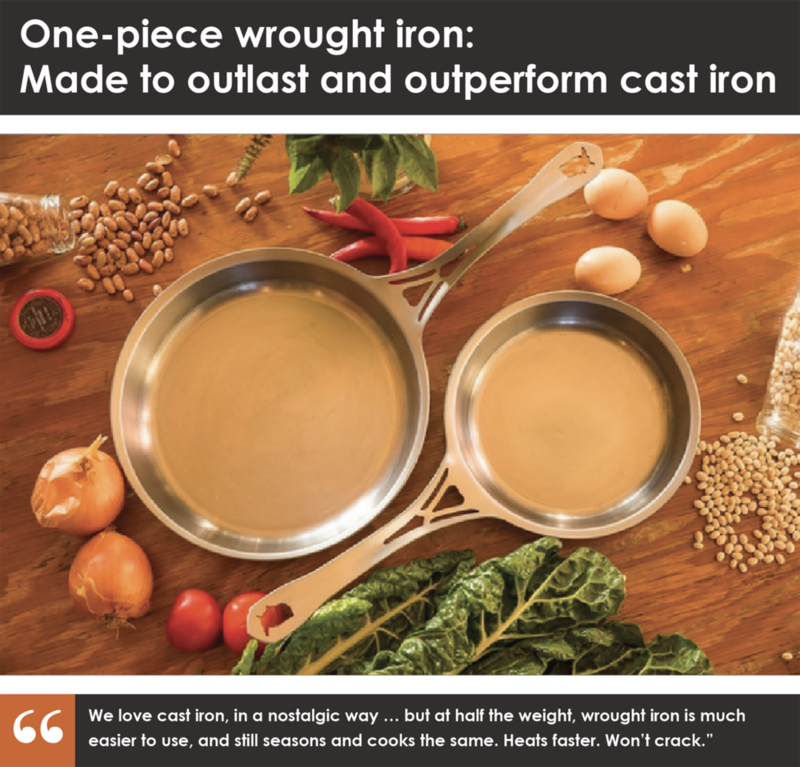 Our wrought iron is also more conductive than carbon steel, cast iron, and stainless steel meaning that our pans heat quickly, and foods cook evenly and consistently, every time. The biggest steaks also don't cool down our 3mm thick, conductive iron mass: they sear like heavier cast iron! Together we're making history, not just the best cookware! Made in Sydney, Australia, AND now Chicago, USA! We've just launched our SOLIDteknics USA Facebook page! Please 'like' the page if you're a US-based fan of our cookware, or a supporter/collector from anywhere in the world, to keep up with the launch of our limited First Edition USA nöni pans on Kickstarter THIS month. 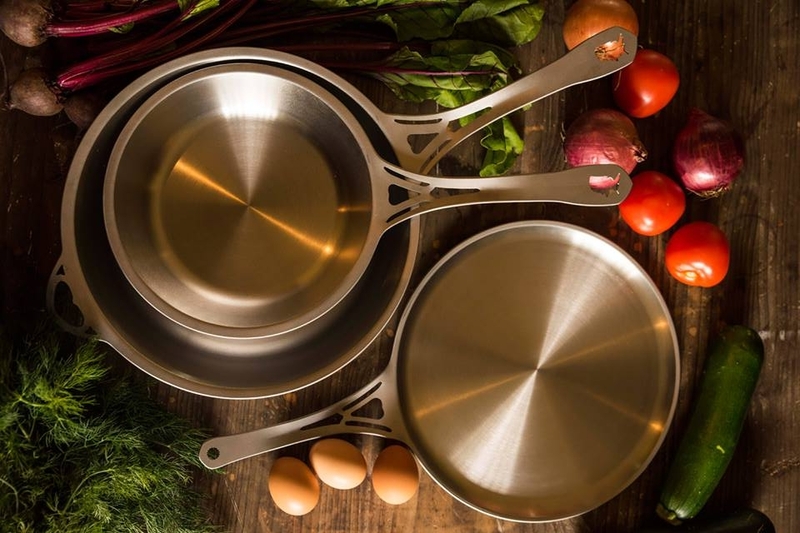 SOLIDteknics USA: making history, not just seamless highly conductive cookware! March 2018 - The cat is out of the bag! Watch the unveiling of one of the best-kept cookware industry secrets to Chef Marshall at a very special place in Chicago. We will reveal more launch details soon (our first USA Kickstarter will launch within 2 weeks), and it will all make sense. For now, just enjoy the leap of this Aussie innovation to 'next level', after a *mountain* of hard work! In a couple of days we post Episode 3 to this page, where we go out on the factory floor and show Chef Marshall watching one of our patented seamless 1pc pans being made before his eyes. The shock on his face is priceless! Mark J Henry was proud to see 20+ years of my best design work on display in Chicago IHA. Next time we are at a show be sure to swing by and we’ll chat about changing this industry, one healthy sustainable indestructible product at a time!